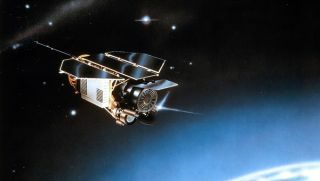 Artist's impression of the ROSAT satellite in space. Less than a month after a dead NASA satellite came crashing to Earth, the sky is falling again. The defunct 2.7-ton German ROSAT satellite is slated to make a fiery, uncontrolled re-entry to our atmosphere sometime Saturday or Sunday (Oct. 22 or 23). Experts say the broken-up bits of ROSAT have a roughly 1-in-2,000 chance of hitting someone somewhere on Earth. That risk, while still quite remote, is higher than the 1-in-3,200 chance posed by NASA's UARS satellite, which fell uneventfully into the Pacific Ocean on Sept. 24. "On Sunday, 23 October 2011, between 1:45 UTC (3:45 CEST) and 2:15 UTC (4:15 CEST) the german ROentgen SATellite ROSAT has re-entered Earth's atmosphere. There is currently no confirmation if pieces of debris have reached Earth's surface." Video: Where Will Germany's ROSAT Satellite Fall? Whether you're concerned about the coming ROSAT crash or merely curious, here are a few questions (and answers) SPACE.com compiled using resources provided by the German Aerospace Center (also known by its German acronym, DLR). What does ROSAT stand for? This is a simple one: Roentgen satellite. During its working life, ROSAT peered at the universe in X-ray wavelengths, so it was named after Wilhelm Roentgen, the German physicist who discovered this extremely energetic type of light. How old is the satellite, and what was its purpose? ROSAT launched in 1990 and performed science operations for eight years. Its mission was to investigate the origin, spectral composition and energy distribution of X-ray radiation throughout the universe. The satellite completed the first-ever full-sky survey with an imaging X-ray telescope. It also discovered that almost all astronomical objects emit X-ray radiation, including bodies such as comets. The ROSAT satellite was launched from Cape Canaveral in Florida on June 1, 1990 aboard a Delta 2 rocket. Originally, the plan was to put ROSAT in Earth orbit using a space shuttle. Following the Challenger accident in 1986 (when ROSAT was under construction), it was decided to use a rocket instead. Will ROSAT's re-entry be controlled in any way? Will ROSAT burn up completely in Earth's atmosphere? Probably not. DLR projections suggest that up to 30 individual ROSAT pieces, with a total mass of up to 1.7 tons, might reach Earth's surface. The satellite's X-ray optical system, or at least a chunk of it, could be the heaviest single component to reach the ground. The fragments that do hit Earth could be travelling as fast as 280 mph (450 kph). When and where will ROSAT come down? Experts think the satellite should return to Earth Saturday or Sunday (Oct. 22 or 23), but it's impossible to peg an exact time or place yet. Even just one day before the spacecraft leaves orbit, DLR officials said, the timing can only be predicted to within plus or minus 5 hours, or 6.5 orbits of Earth. Since Earth rotates beneath the orbit of the satellite, the area on the planet's surface that could be affected by falling debris — known as the ground track — changes from one orbit to the next. A few hours before ROSAT is predicted to come down, it might be possible to specify the ground track of the orbit during which re-entry is probably going to occur. If fragments of the satellite do reach Earth's surface, they will come down along this ground track across a swath up to 50 miles (80 km) wide. What are the odds that a piece of ROSAT debris will hit someone? The likelihood of a person getting injured as a result of the re-entry is still extremely low. The probability of someone somewhere on Earth getting hit is about 1 in 2,000. Those odds are for any one of the nearly 7 billion people on the planet. That odds that debris will hit you in particular — or any other specific person — are still just one in several trillion. This exclusive image was made by Ralf Vandebergh, who said: "It is false-color to increase certain visible contrasts. A very special detail visible is the shadow of the body (the telescope) on the solar panels! You can see the angle with the sun and the observer (me) as ROSAT passed not overhead but [at] 51.4 degrees northern latitude. This is a very difficult observation as the object is very small." Will the re-entry be visible to skywatchers? It's unlikely that anyone will be able to observe ROSAT's re-entry, DLR officials said. Most objects from space that enter Earth's atmosphere come down over the ocean or over sparsely populated regions. But you never know, so you may as well crane your neck up once scientists have a better idea of when exactly the satellite is coming down. Why don't we intercept ROSAT and bring it down in a controlled manner? According to DLR officials, the technologies for capturing satellites and de-orbiting them under controlled conditions using robotic spacecraft are still at the development stage. It will be at least several years before the first demonstration missions of this kind will be launched. However, even once these technologies become available, only a few objects will be selected for controlled re-entry. There's so much space junk up there that we just can't deal with most of it. Should we expect more satellite falls in the future? Yes. Satellite re-entries cannot be avoided, and space debris re-enters Earth's atmosphere on an almost weekly basis. Over the last few years, this debris has amounted to about 60 to 80 tons per year. This total includes small items as well as satellites and the spent upper stages of rockets. However, pieces of debris have been found on the ground only in rare cases. The total mass of natural objects reaching the Earth's surface (meteorites) far exceeds that of debris from man-made objects.